Keynote Speech by H.E. 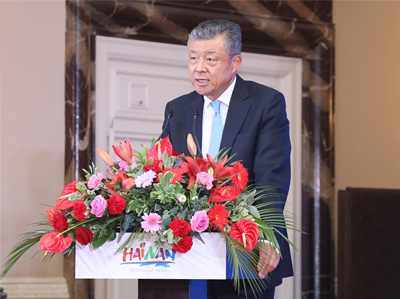 Ambassador Liu Xiaoming at the 2018 Hainan Free Trade Zone (London) Promotion: A New High Ground of Reform and Opening up, A New Contribution to China-UK "Golden Era"
It is a real delight to join you at the 2018 Hainan Free Trade Zone (London) Promotion. On behalf of the Chinese Embassy, let me begin by extending my warmest welcome to Vice Governor Mao Chaofeng and his delegation, who have come all the way from China. I also want to welcome the British friends from all sectors! Hainan is known as "Qiong" for short, meaning "beautiful jade". With its picturesque scenery and warm climate, this southern frontier province definitely lives up to its reputation. This year marks the 40th anniversary of China's reform and opening up policy. It is also the 30th anniversary of the establishment of Hainan province and special economic zone, the largest and only provincial level SEZ in China. The past thirty years of strenuous efforts have given this beautiful jade a dazzling shine. What is more significant and exciting is that President Xi Jinping announced last April that Hainan was to establish a pilot free trade zone and explore the building of a free trade port. This will have a strategic and far-reaching impact on the future development of Hainan province and even the whole of China. First of all, this is a demonstration of China's renewed courage to open up wider to the world. China is building an upgraded version of an open economy. That means we are working on a more comprehensive, substantial and diverse structure of opening up. This decision to build a pilot free trade zone and a free trade port in Hainan came only three days after President Xi Jinping announced in Boao that China would take important measures to open up further to the world. Therefore, it became a major step of China to live up to the promise of further opening up. It demonstrates China's firm resolve to uphold free trade and promote economic globalization. It also shows that China, as a big country, means what we say. We honour our commitment with concrete actions. Second, this is a new experiment with deeper reform on all fronts. Hainan was born of reform and has prospered with opening up. The audacious, enterprising and down-to-earth spirit runs in the blood of the people of Hainan. The building of a pilot free trade zone and free trade port will create new opportunities for Hainan to upgrade its economy and to reform its institutional structure. Hainan will continue to serve as a "testing ground" for reform and opening up. This is aimed at exploring effective approaches to deeper reform and higher-quality growth. These approaches can then be introduced to the rest of the country. Third, this is a fresh impetus for the opening up and development of Hainan. Since becoming a province and a special economic zone, Hainan has made its name in a number of areas. It is an international tourist resort. It is a tropical agricultural base. It is a medical tourism pilot zone. In particular, the annual conference of the Boao Forum for Asia has helped spread Hainan's name all over the world. Confucius said, "At 30, one has established himself." Now the 30-year-old Hainan province is ready to take up its new mission of reform and opening up in the new era. Building a pilot free trade zone and a free trade port will inject fresh and strong impetus to the opening up and development of Hainan. This will strengthen Hainan's position in the Belt and Road development. This will also become a strong pillar for building a more beautiful Hainan. Britain and Hainan are separated by vast oceans. But the similarity between their popular scenic spots make the two mirror images of each other. Here, the British people call theirs "Land's End". In Hainan, people call theirs "End of Sky and Ocean". Both "End's" have breathtaking views. Both peoples have inclusive mind, broad vision and pioneering spirit. The UK has built the nation on trade. It is working to fulfill the vision of a "global Britain" by expanding foreign trade and investment. Hainan is one of the most open and dynamic regions in China. By building the pilot free trade zone and free trade port, Hainan is committed to setting a new benchmark for all-round and deepening reform and opening-up in China. 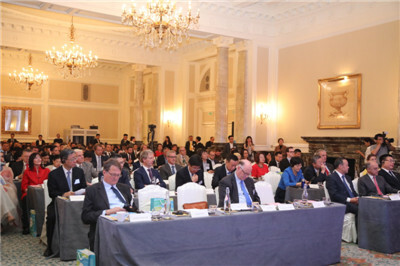 This will create new opportunities for cooperation between Hainan and the UK. So, what should we do to take Hainan-UK cooperation to a new level? Here are my three thoughts. First, the building of the pilot free trade zone and free trade port in Hainan could be the new engine to drive business cooperation. This is a pilot project to experiment with further opening up of China's market. There will be policies to enhance trade and investment facilitation. As a result, Hainan will open up to the world at a higher level. It will be more business-friendly. Its experience will have a stronger and more extensive influence throughout the country. British people are known for daring to be a pioneer and having keen eyes for opportunities. I therefore encourage the British businesses to play a leading and active part in building the pilot free trade zone and free trade port in Hainan. I hope you will take your business to Hainan and seize your share of the opportunities. Second, the three pillars for Hainan's development should be the focus for cooperation. In building the pilot free trade zone, Hainan will concentrate on its natural endowment, give priority to tourism, modern services and hi-tech industries, and build an innovative economy. To be more specific, emerging sectors such as bio-technology, health and medical care, ocean economy and space technology will be the focus of accelerated efforts. The UK has considerable strengths and a unique competitive edge in all these sectors. The two sides should strive to match their development strategies and identify the priorities for advancing their cooperation. Yesterday, direct flight between Sanya of Hainan Province and London was launched. I am sure this will facilitate closer exchanges and cooperation between Hainan and the UK. Third, the Belt and Road Initiative offers a platform to tap the potential for cooperation. Hainan is an important hub on the 21st Century Maritime Silk Road. There is a huge potential for cooperation between Hainan and the countries along the Maritime Silk Road. The areas for such cooperation include agriculture, tourism, environmental protection and "blue economy". The UK, with rich expertise in finance, legal affairs, consultancy and management, could provide the services needed in specific projects. This will in turn contribute to the overall cooperation between China and the UK on the Belt and Road Initiative. A pop song from the early 1980s described the beauty of Hainan. The title of this song is Welcome to the End of Sky and Ocean. With this song in mind, I hope and believe that Hainan's free trade zone and free trade port will make this province a new high ground for China's reform and opening up. This will shorten the distance between "Land's End" and "End of Sky and Ocean". 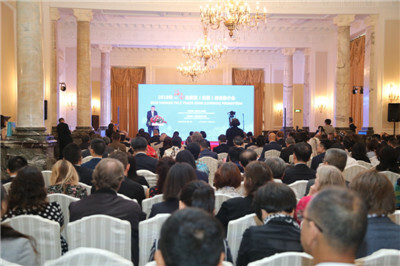 This will strengthen the business cooperation between China and the UK. This will be a great contribution to China-UK "Golden Era"! 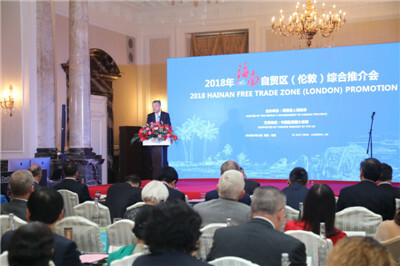 In conclusion, I wish the 2018 Hainan Free Trade Zone (London) Promotion great success!